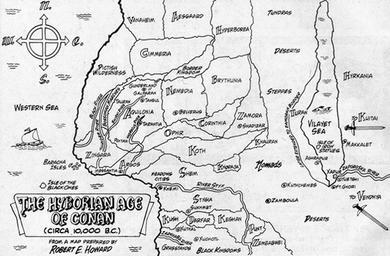 One thing that interested me when reading the Conan stories was Robert Howard’s idea of the Hyborian Age, a mythical era in the distant past when the Eurasian continent was physically different but still generally recognizable, and its people ancestors of the current nations. The names for his fictional kingdoms reflected a variety of mythical sources, including Hyperborea from Greek mythology, Asgard and Vanaheim as earthly countries instead of heavenly ones as per Snorri Sturluson‘s take on Norse mythology, and the wealthy but never clearly identified land of Ophir from the Bible. I’ve recently been examining J.R.R. Tolkien’s presentation of Middle-Earth as a version of Europe from about 6000 years before his own time, and it’s interesting how two influential fantasy authors working at around the same time both used this idea. In fact, the maps that I’ve seen are pretty similar, with the Sea of Rhun or Vilayet Sea paralleling the Caspian, the area that would become Britain not yet being an island, and the Bay of Belfalas and unnamed bay in Howard’s world as smaller versions of the Mediterranean. We know that Howard was influenced by Theosophy, a sort of New Age occult belief system popular at the time that mixed together elements of many different religions and mythologies. I recently came across this article on Middle-Earth chronology, which suggests that Tolkien might have also been familiar with it. This has sparked some controversy among Christian fans, but the fact that Tolkien might have referenced Theosophy doesn’t necessarily mean he believed any of it. One of the main arguments in the article is that the period from the sinking of Beleriand at the end of the First Age to the beginning of the Fourth Age in Tolkien’s mythology is exactly the same as that from the sinking of Atlantis to the beginning of the Kali Yuga (the Fourth Age of Hindu chronology) in Theosophy, 6462 years. The author does admit that it was Numenor, not Beleriand, that was Tolkien’s version of Atlantis, however. 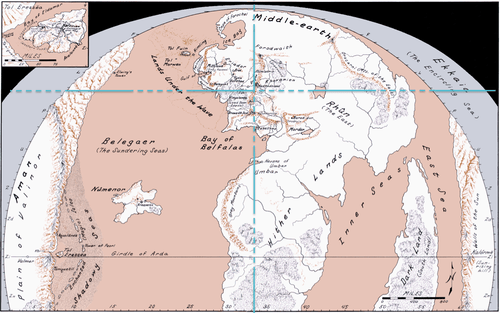 Atlantis and other lost continents were extremely important in Theosophy, and also figure into both Tolkien and Howard’s universes. It all ties in with the concept of lost civilizations, which I’ve previously discussed in conjunction with video games. While Middle-Earth and the Hyborian world don’t have computers and robots, they do have iron weapons and tools, as well as cities, agriculture, and writing, long before anything archaeologists have discovered. For that matter, The Flintstones is basically a jokey take on the same trope, with a Stone Age civilization approximating modern society largely through harnessing animal power. Interestingly, while L. Frank Baum’s interest in Theosophy is well-known, he really didn’t use the lost world idea. His fairylands mostly existed in modern times but in an isolated, uncivilized part of the world, with The Enchanted Island of Yew being the only major exception that I can think of. He did mention Atlantis in Dorothy and the Wizard in Oz, but the only thing he tells us about it is that it was home to a green dragon 20,000 years previously “in a time when humans had not yet been created,” at least according to a haughty dragonette. We’re also told in a few different Baum books that fairies had electric light long before mortals did. This entry was posted in Authors, Cartoons, Fairy Tales, Greek Mythology, History, J.R.R. Tolkien, L. Frank Baum, Maps, Mythology, Norse, Oz, Oz Authors, Philosophy, Places, Religion, Technology, Television, The Flintstones, Theosophy and tagged asgard, atlantis, beleriand, bible, conan the barbarian, dorothy and the wizard in oz, dragons, hyborian age, hyperborea, kali yuga, middle-earth, numenor, ophir, robert howard, snorri sturluson, the enchanted island of yew, vanaheim. Bookmark the permalink. Fascinating subject, and one that interests someone like me whose trying to syncretize the various fantasy mythologies into a single chronological stream, with allowances for variations and error, such as retellings of ancient tales will often contain. Yeah, I don’t think there’s any way to combine EVERYTHING, but there are a lot of surprising similarities between certain fantasy universes.